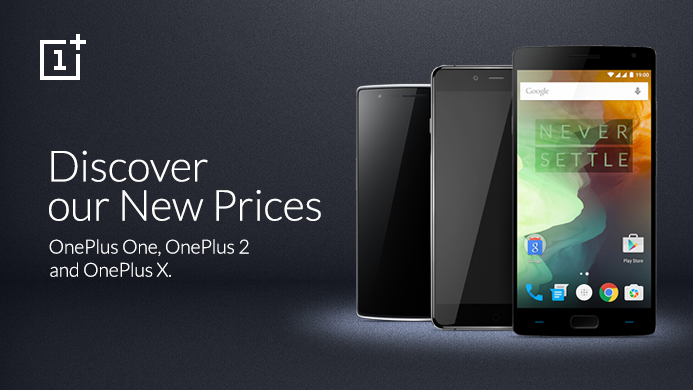 We’ve got good news for all OnePlus fans: starting today, we’re lowering the price on all of our smartphones. Our focus remains on providing the best possible smartphone experience for you, and what better way than this? We’re all in this together, after all. So, what’s the best OnePlus device for you? If you’re looking for the smartphone that started it all (but can still keep up with the big boys), the OnePlus One is for you. For a serious technical powerhouse, look no further than the OnePlus 2. Finally, the OnePlus X encapsulates the best parts of our design philosophy, and truly stands on its own as a beautiful, stylish device for every occasion. If you always felt like taking one of our smartphones for a spin, but never got the chance to, this is the perfect time to find out what OnePlus is all about! Visit https://oneplus.net to discover our new prices now! P.S. Just ordered a OnePlus smartphone? Not to worry! Anyone who purchased a OnePlus device within the last 14 days can contact our customer support at https://oneplus.net/support to request a refund of the price difference. OnePlus 2, the flagship smartphone that was released last year features Qualcomm’s Snapdragon 810 chipset coupled with 4GB of RAM. You have to be aware that while the powerful smartphone does not have a microSD card slot, it does have 64GB of internal memory, which should be sufficient for majority of users when they want to carry around a ton of media in their mobile device. One core reason why you would want to make your purchase right now is because it costs just $299. However, if you feel that the price tag is still too steep, then the OnePlus X, which costs $199 will definitely fit your budget. The affordable smartphone features a Snapdragon 801 chipset, 3GB of RAM and it is the first smartphone from the entire lineup that not only features an AMOLED display, but a microSD card slot capable of expanding your external memory to 128GB. Though it just has 16GB of internal storage, you have the choice to expand that storage at will. These discounts are no doubt being introduced on account of OnePlus 3 being introduced to the public. OnePlus is making a very smart play, as it will be able to sell several units before the grand unveiling of the Snapdragon 820 powered flagship.